Heat oven to 425°F. Rub beef roast with salt and pepper. In medium bowl, mix parsley, oregano, rosemary, garlic and oil. Press mixture onto top and sides of beef. Place beef on rack in shallow roasting pan. Place bacon slices over top of beef, tucking ends under bottom. Insert meat thermometer so tip is in thickest part of beef. Bake uncovered 35 to 50 minutes or until thermometer reads 140°F for medium-rare or 155°F for medium doneness. Remove beef from oven, cover with foil and let stand about 15 minutes until temperature rises 5°. Use thin or regular slices of bacon instead of the thick-sliced variety so the bacon cooks in the time the roast cooks. 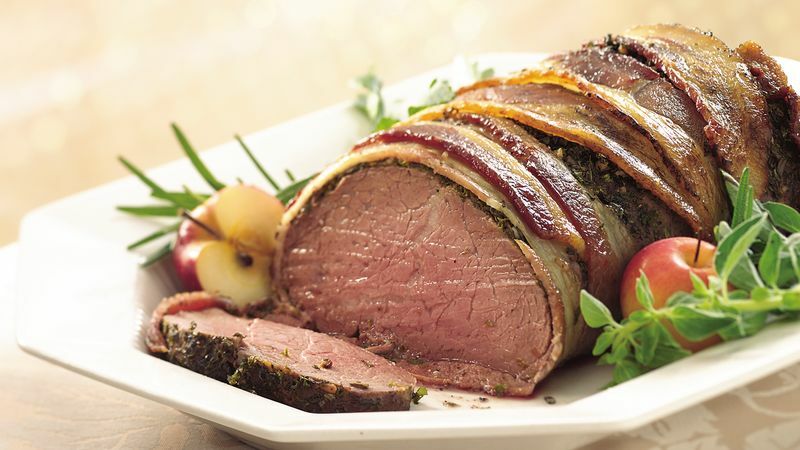 The roast can be coated with the herb mixture and covered with the bacon several hours ahead of time; cover and refrigerate. Add a few extra minutes to the baking time. Garnish the roast with fresh herbs and crab apples.